Egypt Supreme Court house in Cairo (photo via Flickr user Rachid H). Background: The Law Organizing the Seizure, Inventory, Management, and Use of Terrorist Organizations’ and Terrorists’ Funds (the Terrorist Funds Law) went into effect after it was ratified by President Abdel-Fattah El Sisi and published in the Official Gazette edition dated April 21, 2018. Previously, it had been rushed through the legislative process, as the House of Representatives approved the draft law in less than one week upon receipt of it from the cabinet. 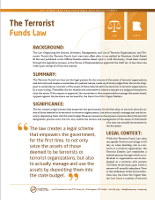 Summary: The Terrorist Funds Law lays out the legal process for the seizure of the assets of terrorist organizations and terrorists and creates a committee of a judicial nature, made up of seven judges from the courts of appeal, to undertake an inventory of the assets of those determined to be terrorists or terrorist organizations by a court ruling. Thereafter, the law enables the committee to submit a request to a judge pro tempore to seize the assets. If the request is approved, the committee is then empowered to manage the assets seized. 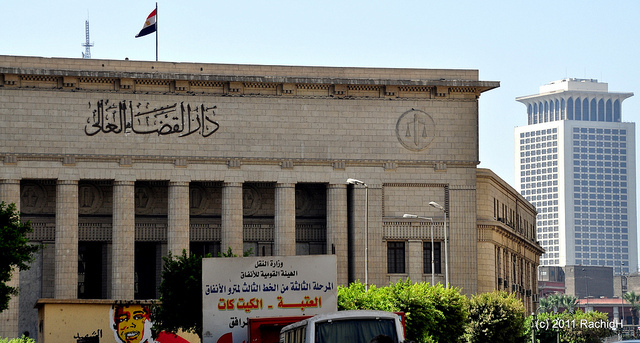 Appeals against the decisions can be heard by the Cairo Court for Urgent Matters. Significance: The law creates a legal scheme that empowers the government, for the first time, to not only seize the assets of those deemed to be terrorists or terrorist organizations, but also to actually manage and use the assets by depositing them into the state budget. Because numerous due process concerns about the terrorist designation process exist, this law may enable the seizure and management of the assets of individuals who may not actually be terrorists in the first place. Legal Context: While the Terrorist Funds Law does not specify which court rulings it will rely on when deciding who is a terrorist or a terrorist organization, the Terrorist Entities Law establishes a judicial process through which an individual or organization can be designated as a terrorist—this process will likely be the basis upon which a seizure will actually take place. Prior to the ratification of the Terrorist Entities Law, the Court for Urgent Matters had heard a number of terrorist designation cases as well. Important to note is that the Counter-terrorism Law sets forth the state’s official legal definitions for a terrorist and terrorist organization. Political Context: The Terrorist Funds Law was approved amid Egypt’s Operation Sinai 2018, a large-scale military operation announced in February 2018, and the country’s continued “war on terror.” Additionally, ratification of the law follows a number of prior attempts to seize and control the assets of those deemed to be terrorists, including the work of a committee created in 2013 to manage the assets of the Muslim Brotherhood and various cases brought before the judicial system. Adherence to Legal Norms: Article 237 of the Egyptian Constitution reads: “The state commits to fighting all types and forms of terrorism and tracking its sources of funding within a specific time frame in light of the threat in represents to the nation and citizens, with guarantees for public rights and freedoms. The law organizes the provisions and procedures of fighting terrorism, and fair compensation for the damages resulting from it and because of it.” At the same time, however, Egypt’s domestic and international legal obligations commit the country to respecting and protecting the due process rights of individuals and the right to private property, among other related rights; a legal scheme which allows the state to possess and actually use the assets of an individual as a result of a murky legal process calls into question many of these obligations. Implementation: On September 11, 2018, the committee established by the Terrorist Funds Law stated that it would seize the assets of 1,589 individual Brotherhood members and supporters, 118 companies, 1,133 nongovernmental organizations, 104 schools, 69 hospitals, and 33 websites and satellite channels; one day later, this order was affirmed by the Cairo Court for Urgent Matters.